Anthracnose is characterized by blight of very young leaves and shoots or by irregular necrotic blotches on expanded leaflets. 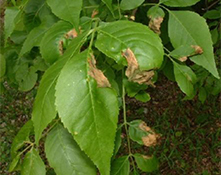 In years of prolonged wet spring weather with moderate temperatures, the leaf and shoot blight phases of anthracnose may kill almost the entire first flush of shoots on highly susceptible trees. Severe defoliation in several successive years may lead to dieback. Usually the damage is minor and defoliation is restricted to lower branches. Symptoms of anthracnose arise in spring on succulent, expanding shoots and leaves as water-soaked spots that may enlarge and coalesce rapidly. The result is discrete brown or more commonly tan blotches in distorted leaflets. In timing and appearance this damage is similar to frost injury. 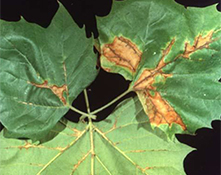 “Anthracnose” refers to several plant diseases caused by several different fungi that cause dead spots on leaves or fruits. 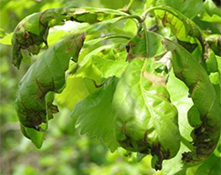 This disease may also affect the twigs, causing a canker and dieback. Infected areas may coalesce into large necrotic spots as the disease spreads. In severe cases, this condition defoliates the plant. Leaf spotting itself is not harmful. However, extensive annual defoliation year after year can lead to plant decline and death. Cool, wet, cloudy spring weather promotes infection by fungi that cause leaf spot and anthracnose. It is most severe where spring rains coincide with new growth. Spores produced from fruiting bodies on infected leaves and twigs spread by splashing rain to healthy tissue and nearby trees. Apply approved fungicide treatments at 10-14 day intervals, beginning before bud burst and continuing.